The Independent Handbag Designer Awards by Handbag Designer 101 was created to celebrate handbag design and creativity from the United States and around the world. Now in its 13th year, it is an industry staple and is the only international design competition to discover, recognise and create brand awareness for a global pool of independent handbag designers. 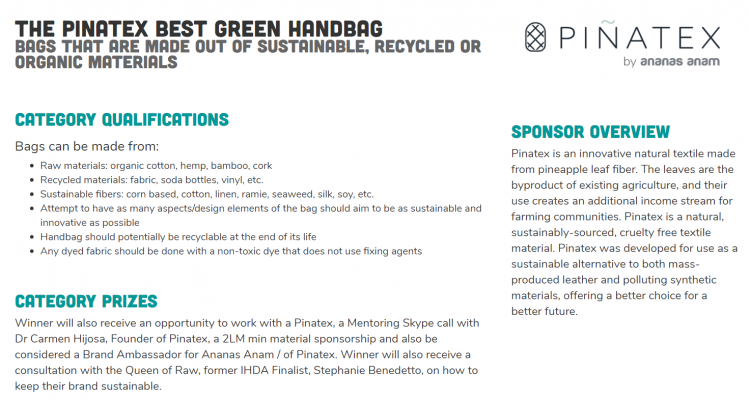 Ananas Anam are the proud sponsors of the competition category named ‘The Piñatex Best Green Handbag’ which aims to challenge designers worldwide to make a bag made from sustainable, recycled or organic materials. The winner will receive an invaluable mentoring skype call with Dr. Carmen Hijosa, Founder of Ananas Anam and inventor of Piñatex, a 2LM min material sponsorship and will be considered a Brand Ambassador for Ananas Anam/Piñatex. The winner of this category will also receive a consultation with the Queen of Raw, former Independent Handbag Designer Award Finalist, Stephanie Benedetto, on how to keep their brand sustainable.